The ruling was a significant defeat for the Department of Justice, which stunned the legal establishment with its November challenge of the transaction. A federal judge in Washington on Tuesday cleared the $85.4 billion merger of AT&T (T - Get Report) and Time Warner (TWX with no conditions in a landmark decision expected to encourage more vertical combinations among media and entertainment companies. The ruling by U.S. District Court Judge Richard Leon was a significant defeat for the Department of Justice, which stunned the legal establishment with its November challenge of the transaction -- the first lawsuit against a vertical deal in more than 40 years. In a statement, Assistant Attorney General for the DOJ's Antitrust Division Makan Delrahim said that the DOJ was disappointed by the court's decision. "We continue to believe that the pay-TV market will be less competitive and less innovative as a result of the proposed merger between AT&T and Time Warner," Delrahim wrote. "We will closely review the Court's opinion and consider next steps in light of our commitment to preserving competition for the benefit of American consumers." 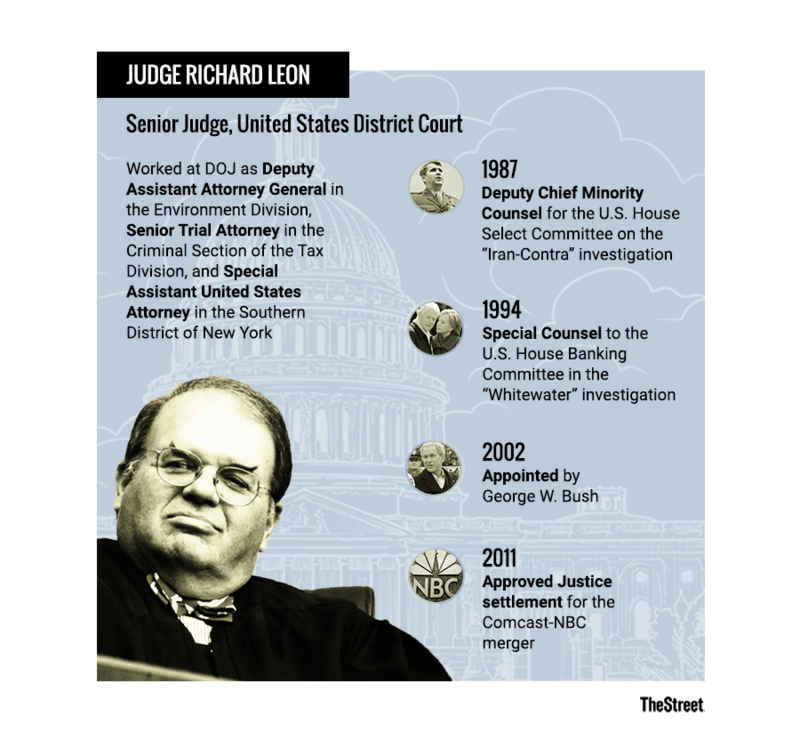 Judge Leon announced his decision during a packed courtroom session in Washington that began at 4 p.m. ET, after the market closed. In a statement, AT&T said it looks forward to closing the deal on or before June 20, according to CNBC. AT&T's stock were down about 2% after hours after the decision was announced, while Time Warner's stock was up almost 5% after-hours after trading flat during the day. Comcast shares were down about 3.6% after hours, while Fox shares were up almost 7% after-hours. During his presidential campaign, Donald Trump complained about coverage of him on the Time Warner-owned CNN network, and said the merger was one that "we we will not approve in my administration." So far on Tuesday, Trump had not issued any reaction to Judge Leon's decision. Leon had a range of options for how to rule in the case. Justice had pressed him to block the deal outright, but suggested in April closing arguments that the Judge could address the harm to consumers by requiring AT&T to sell Turner or DirecTV. AT&T and Time Warner argued that divestitures were unnecessary, however. Turner made an arbitration offer to pay-TV companies that the defendants said eliminated the threat of price gouging. If a cable, satellite or online distributor requested arbitration, Turner pledged not to withhold its programming, or "go dark." The proposal would have lasted for seven years, the same duration as the concessions in Comcast Corp.'s purchase of a controlling stake in NBC, which Leon himself approved in 2011. Cable operator RCN Telecom Service LLC also gave Leon some suggestions on how to improve AT&T's arbitration proposal and pledge not to go dark, in a mid-May Amicus filing with the court. The offer should apply to all of Time Warner's content, including HBO and Cinemax, RCN suggested. Turner should have to provide information about rates it charges other pay-TV distributors at the start of arbitration, RCN added, and smaller cable operators should also be able to use a bargaining agent, such as the National Cable Television Cooperative, in their negotiations. Daniel Petrocelli, the lead attorney for AT&T and a partner at O'Melveny & Myers LLP, spoke to the media outside the courthouse, where he touted the clearance as a win for consumers and a "sound and proper rejection of all of the government's arguments" to block the merger. Addressing the impact of the decision on other deals pending in the marketplace, Petrocelli was circumspect. "Each and every one of these transactions stands on its own, as this one did," he said. As to whether the DOJ challenge was spurred by opposition from President Donald Trump, who vowed on the campaign trail to block the combination over his objections to Time Warner's CNN, Petrocelli responded: "We have no insight into that."